Pickup trucks are the top-selling vehicles in America, with nearly two million bought every year. They're pricey though, stickered at around $42,000. And the Ford F-150 leads the pack in sales. But the new Chevrolet Silverado and Ram 1500 bring some stiff competition. Ford's F-150 is the top-seller and the ladder for climbing into the bed is a clever feature. But it doesn't earn top scores in Consumer Reports tests in part because handling isn't agile and the ride isn't refined. Both the Chevy and the Ram outscored the Ford F-150 by a considerable margin. Ford F-150 is America’s best-selling light-duty pickup and part of Ford F-Series, America’s best-selling trucks for 36 consecutive years. Ford customers choose the F-150 because it gets the job done comfortably, safely and efficiently with up to 11,300 pounds towing capability and a best-in-class payload of 3,120 pounds. Redesigned for 2014, the Chevy Silverado handles well. 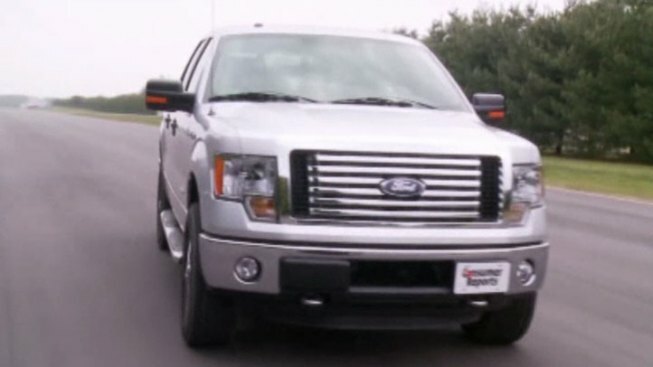 Plus it gets 16 miles per gallon, the best fuel economy of any full-size V8 pickup. It also has very competitive payload and tow ratings. And it has a low step-in height that makes it easy to get in and out. The RAM 1500 trails the competition in sales. But it was updated for 2013, plus a unique rear coil spring suspension gives it the best ride of any full-size truck. And the interior is very quiet. So which one to choose? Consumer Reports finds that the Silverado is the better truck. It has higher payload and tow ratings. It also is more fuel-efficient. But for everyday commuting if you're not using all that truck capability, the RAM is more luxurious and more pleasant. While the sticker price of these trucks is expensive, it's a very competitive market. Consumer Reports says it's worth trying to bargain. You'll likely be able to save thousands of dollars.